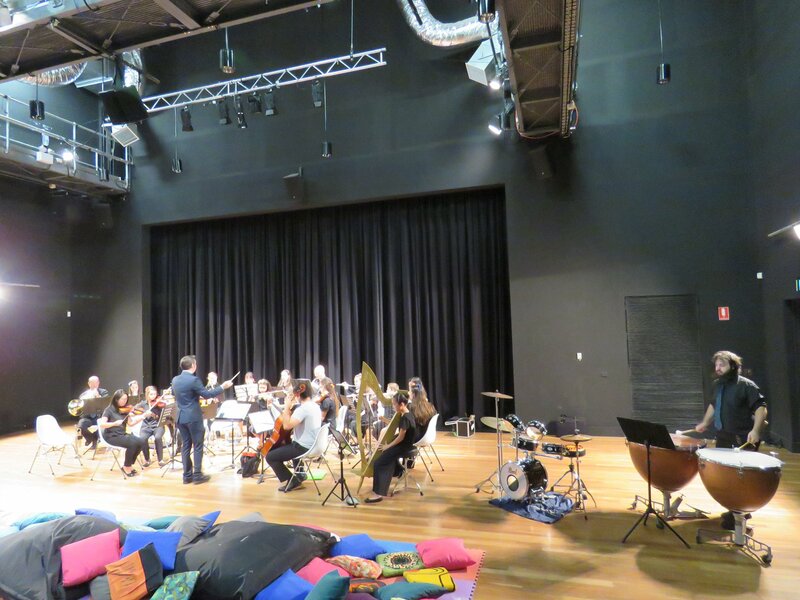 'South West Sydney Philharmonic', designed for advanced musicians, both adult and student age. 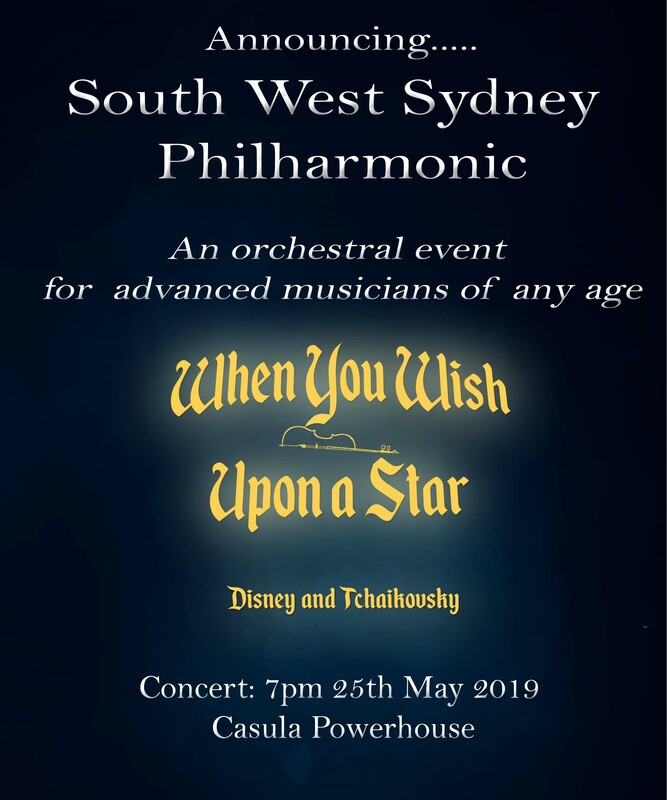 The concert will be titled: 'When You Wish Upon a Star', featuring music from Disney including: Beauty and the Beast, several Pirates of the Caribbean soundtracks, Frozen and Tchaikovsky's Sleeping Beauty. Members will need to attend all or the vast majority of rehearsals. Please note: As at 15 April, all flute, clarinet and French horn positions have been filled. TSO cello superstar Jonathan Bekes will be back in town to run a free development masterclass for FGYO cellists. Details have been sent to all cellists taking part. All Orchestra members are invited to come along to observe. 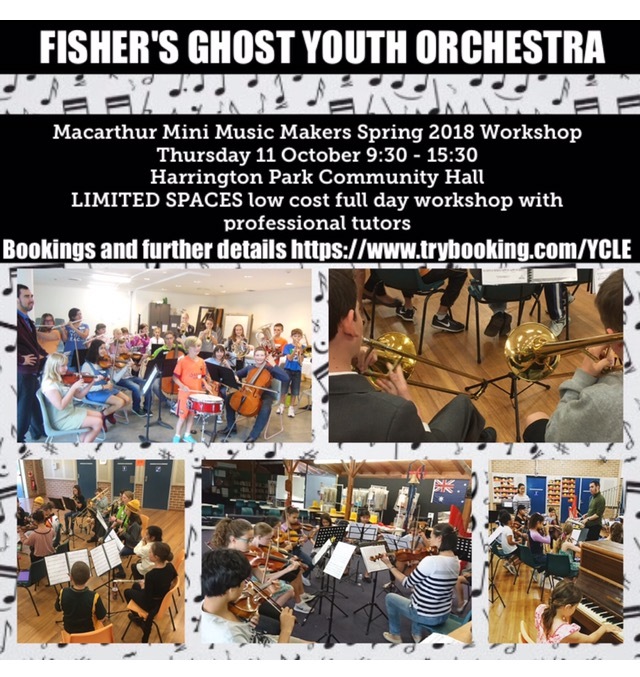 Come join in the fun of our Spring school holiday orchestral workshops at 'Macarthur Mini Music Makers' @ Harrington Park on Thursday 11 October. The workshop runs from 0930 to 1530, with registrations open at 0900, and a short concert for family friends at the conclusion. (3) providing an opportunity to play for an audience. The workshop has been designed for evolving musicians in regular music tuition on orchestral instruments. Talented pianists/percussionists are encouraged to enquire as to availability of speciality places available to them. Enquiries can be directed to fgyo.manager@gmail.com or fgyo,president@gmail.com. A concert for all ages, exploring the magical world of musicals with repertoire from classics such as Mary Poppins through to newer favourites such as The Lion King, interspersed with crowd-pleasing favourites from Bach, Haydn and more! A concert exploring space and cyber themes, with thrilling music from all genres celebrating man's race to other planets and our race towards a digital future via cyberspace and online games! A concert for all ages. FGYO presents 'I Spy ... The Orchestra', and program of orchestral discovery produced by conductor and educator, Maestro David Griffin, for the youngsters of Camden at the Camden Civic Centre. 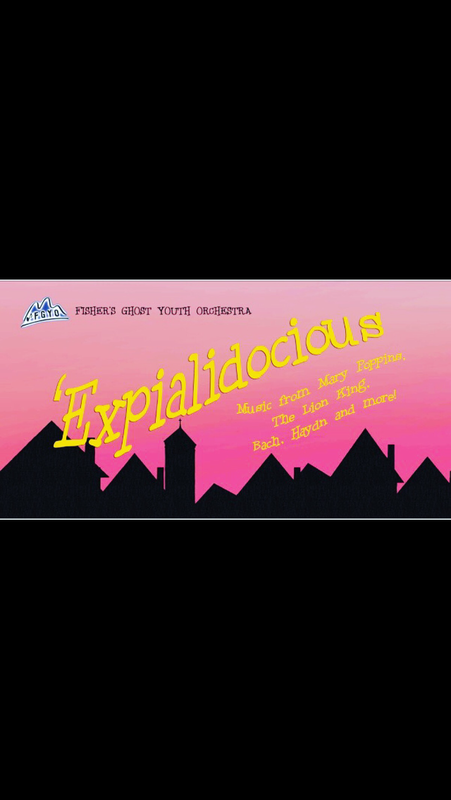 Children will be challenged to a musical game of I SPY WITH MY LITTLE EYE ... exploring the sights and sounds of each instrument of the orchestra, and then being treated to the sounds of a live orchestra in action. Or, to pre-order, email Carla on carlamhill@bigpond.com or phone 4655 9724. Come join in the fun of our Autumn school holiday orchestral workshops at 'Macarthur Mini Music Makers' @ Harrington Park on Friday, 27 April. The workshop runs from 0930 to 1530, with registrations open at 0900, and a short concert for family friends at the conclusion. 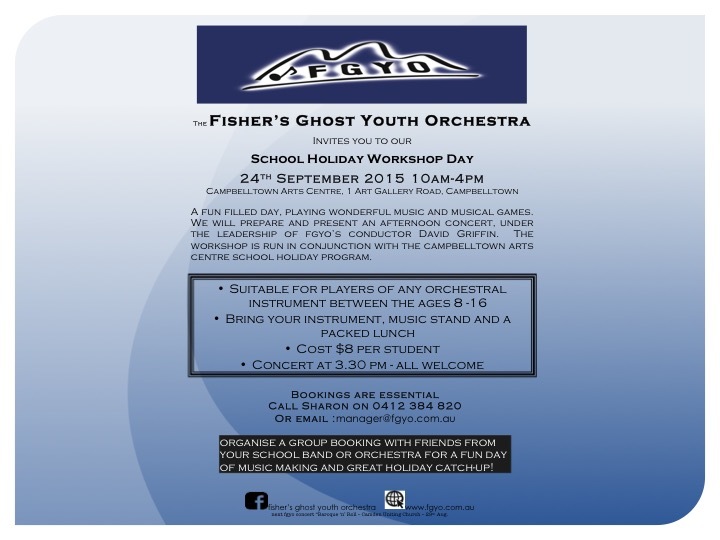 The workshop is $30 for FGYO musicians and $40 for non-members. A promo code (FGYO2018) applies a 10% discount for bookings made by 13 April. - the Australian Federal Government through the Community Capacity Building grants funding. FGYO will be holding a stall at the upcoming Cobbitty Markets to reach out to community members who may not yet know about us and the great work we do, not only in fostering talented young musicians via our Youth Orchestra and Senior Ensemble, but also the work we do in presenting live music opportunities to local school children and young children attending our 'Kids Cushion Concert' series each year. FGYO members are invited to bring along a donation for the cake stall, as well as their instrument to provide a musical backdrop to the most beautiful markets in all of Camden - Cobbitty Markets. Our stall will run from 8am until market close at 1pm. All members are encouraged to join us. Bring your friends for a relaxed weekend catch up, bring you solo music items for a short busk and bring your orchestra music for some on the spot jam sessions with your FGYO friends. Another of our ever popular school holiday orchestral workshops is being planned for mid January. (3) provide an opportunity to play for an audience. The workshop has been designed for evolving musicians in regular music tuition aged 7 through to 14. Music from Beethoven's 9th Symphony, the Dreamtime story "Why the Kookaburra laughs", plus Wagner, Puccini and much more! 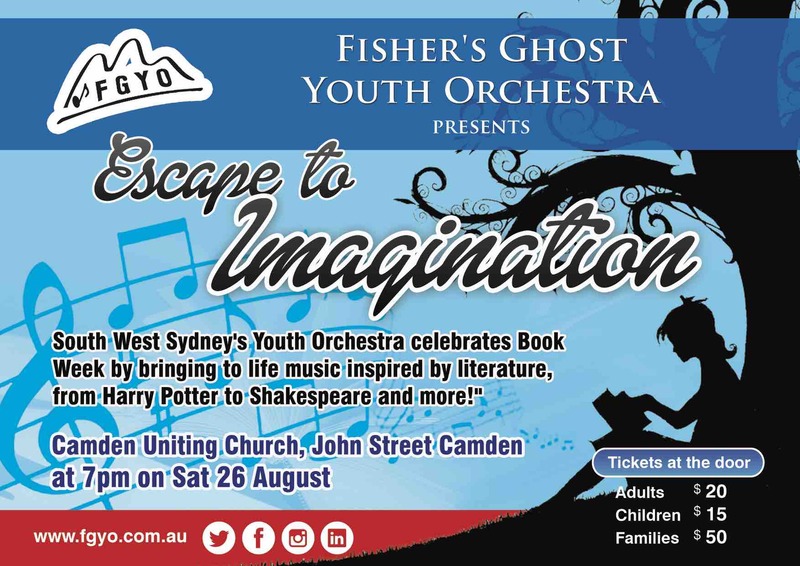 South West Sydney's Youth Orchestra celebrates Book Week by bringing to life music inspired by literature, from Harry Potter to Shakespeare, Jane Austen and more! 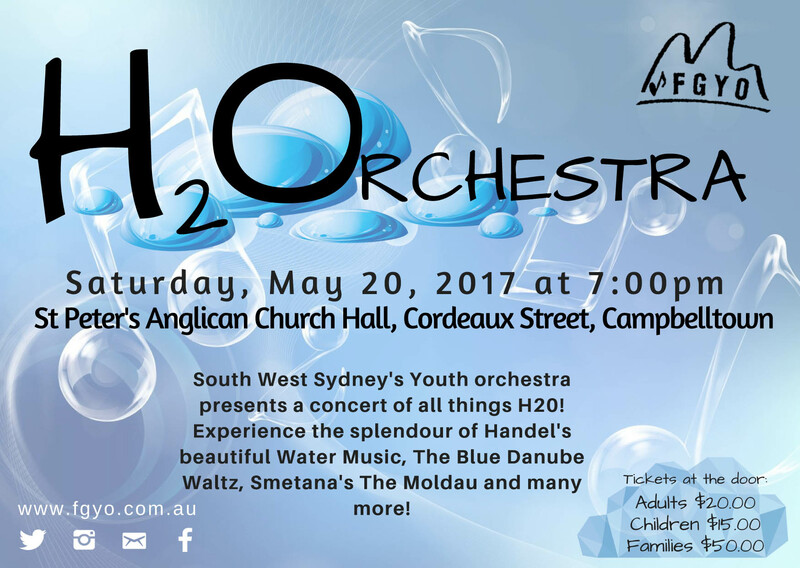 South West Sydney's Youth orchestra presents a concert of all things H20! 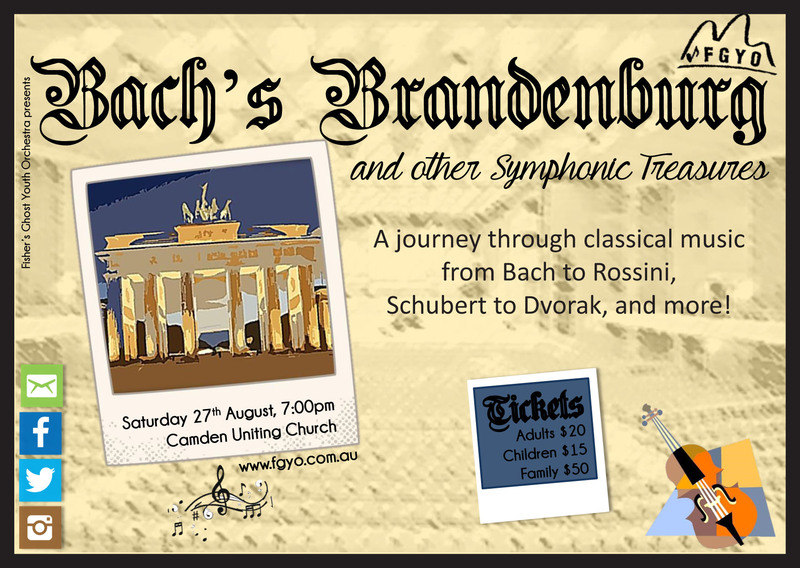 Experience the splendour of Handel's beautiful Water Music, The Blue Danube Waltz, Smetana's The Moldau and many more! Play great orchestral music with other young musicians. Sectional rehearsals with expert specialist tutors. Fun games and activities to break up all the hard work. Full Orchestra rehearsals and a performance. Bring your own cushion, or grab one of ours and get ready to enjoy one of the highlights of Campbelltown Arts Centre’s family music program as David Griffin and the Fisher’s Ghost Youth Orchestra present their new concert ‘Around the World with the Orchestra.’ Aimed at children ages 2-5 this concert presents the perfect introduction to the instruments and sounds of a live orchestra in action. Book early to avoid disappointment! 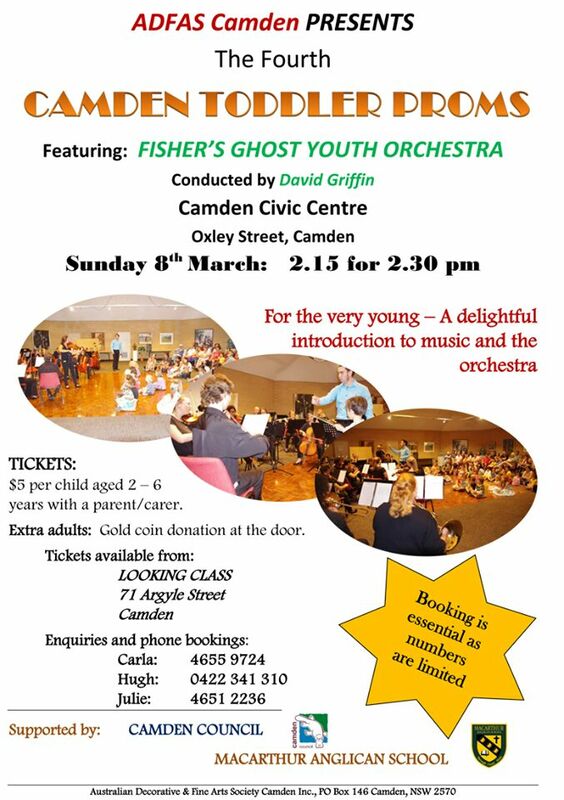 Recommended for kids 2-6 years, the Fisher's Ghost Youth Orchestra, led by conductor and educator, Maestro David Griffin, will be performing for the youngsters of Camden at the Civic Centre. The children will be introduced to each instrument of the orchestra and they will be able to experience the sounds of a live orchestra in action. 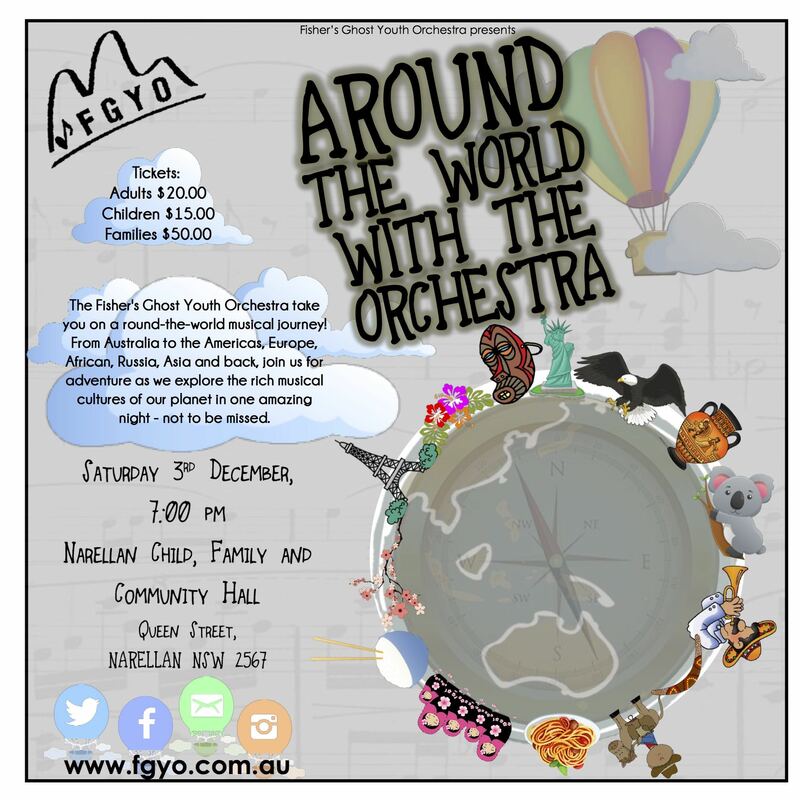 Our theme this year is 'Around the World', with music from Australia to the Americas, Africa, Europe and Asia! Available from Campbell's Looking Class Fashions, 71 Argyle Street, Camden from 28 January 2017 or contact Carla to pre-order on (02) 4655 9724. 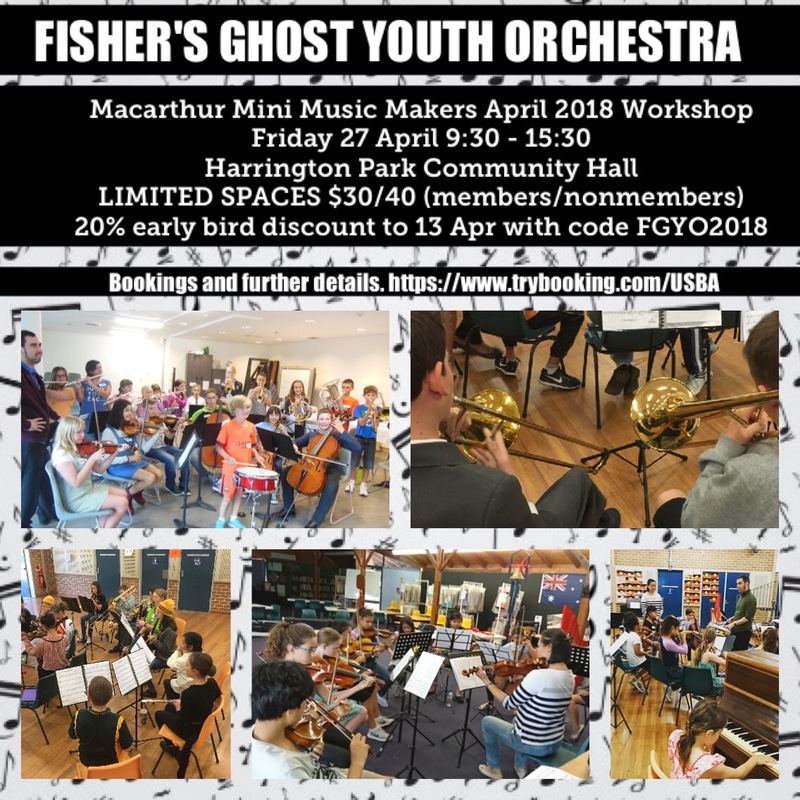 FGYO's popular workshop days provide budding musicians the opportunity to experience the thrill of playing in a real orchestra. Workshop 2 - Advance, is recommended for school years 8-12, up to 25 years of age, OR music grade 4 and upwards. Participants will enjoy learning some great music together as well as participate in some other musical activities. Organize a group booking with friends from your school band or orchestra. We will prepare and present an afternoon concert, under the leadership of FGYO’s conductor David Griffin. Suitable for players of orchestral instruments. Morning Tea provided - please bring a packed lunch. 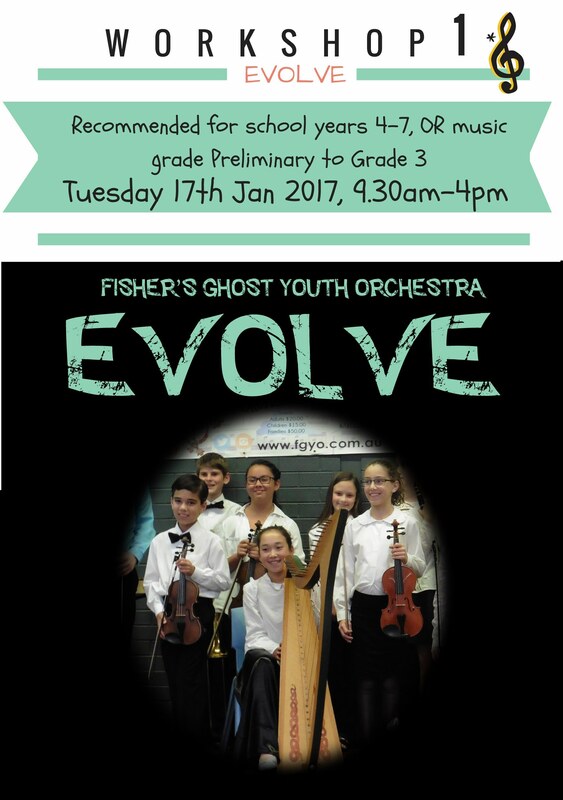 Workshop 1 - Evolve, is recommended for school years 4-7, OR music grade Preliminary to Grade 3. Participants will learn to play great music and participate in some fun, educational musical games and activities. Suitable for players of orchestral instruments, (sorry no percussion players except by special request). 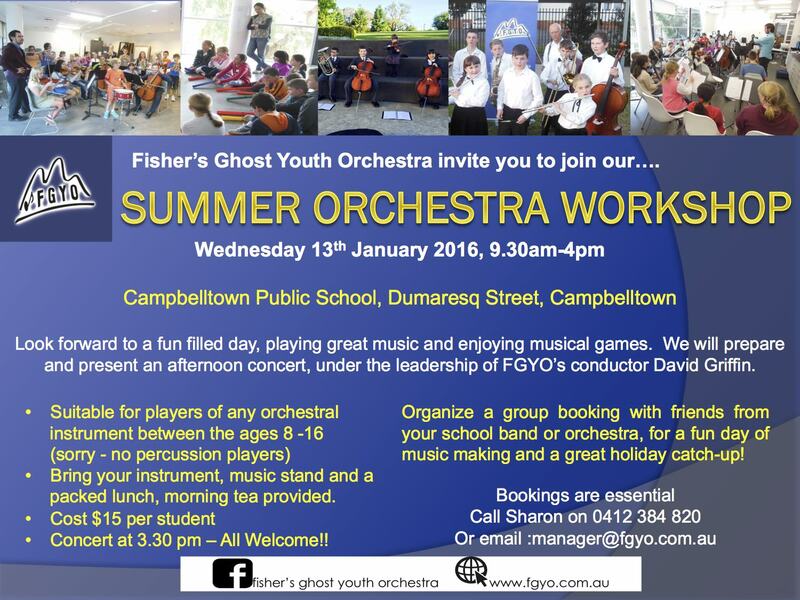 The Fisher's Ghost Youth Orchestra is preparing to take you on a thrilling round-the-world musical journey! Pack your bags for this musical tour of discovery. We travel from Australia to Asia, America, Europe, Russia and more, as we explore the rich musical cultures of our planet. An amazing night - not to be missed! Your favourites from Bach, Mozart, Beethoven, Brahms, Dvorak, Bizet and more! Participants will learn to play some great music and participate in some fun educational musical games and activities. We will prepare and present an afternoon concert, under the leadership of FGYO’s conductor David Griffin. Suitable for students between the ages of 8-16 who play an orchestral instrument. Unfortunately we are unable to cater for percussion players at present. Morning Tea provided - please bring a packed lunch. 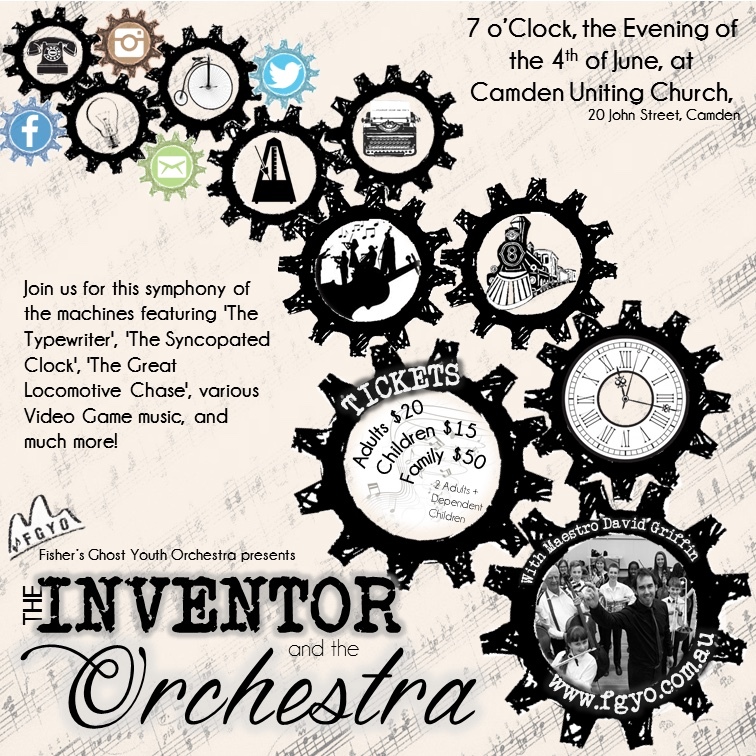 Join us for this symphony of the machines, featuring "The Typewriter", "The Syncopated Clock", "The Great Locomotive Chase", various Video Game music and much much more!! Watch out for FGYO's Flash Mob, Sunday afternoon at 2pm, Level 1 near the customer service desk. 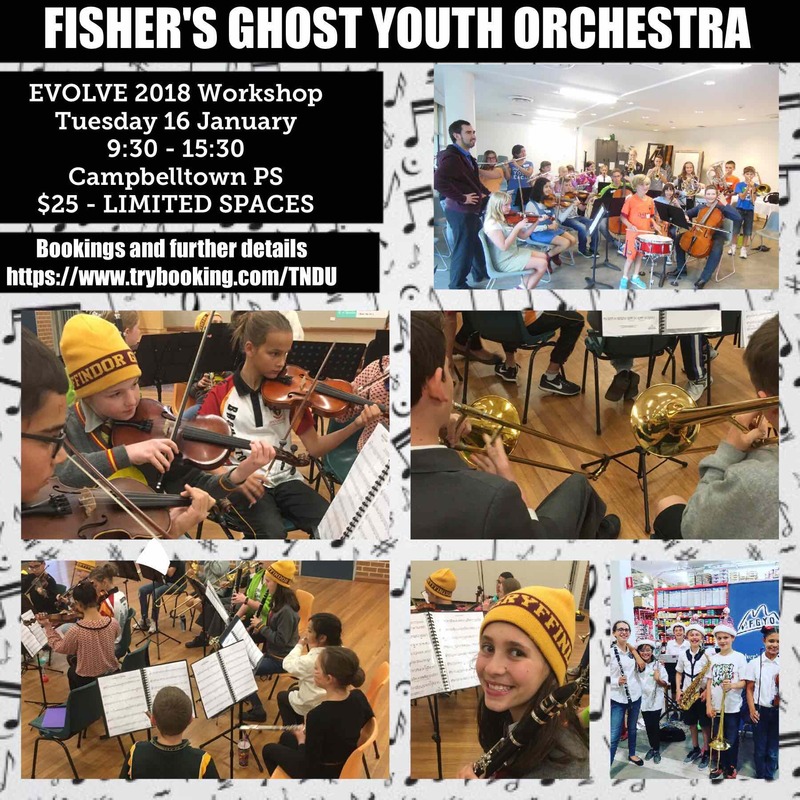 ADFAS Camden (Australian Decorative and Fine Arts Society Camden) is proud to present another of Fisher's Ghost Youth Orchestra's ever popular, Toddler Proms! We perform an A-Z Alphabet Adventure with the orchestra, Three Billy Goats Gruff (or that might be Zebras), Sesame Street and lots more popular favourites. Aimed at children ages 2-6, this concert presents the perfect introduction to the instruments and sounds of a live orchestra in action. Arrive at 1.45 for 2pm start. As the children will be sitting on the floor, it would be advisable to ...bring an easily identifiable cushion with you, so your child is comfortable for the 45 - 60 minute performance. Chairs will be provided for adults and children who are not happy about being so close to the centre of activity. The performance will start at 2.00 pm sharp and we recommend that you arrive a few minutes early so that you can find a place before the programme commences. Numbers of children will be limited, so that those attending can better interact with the orchestra members and their instruments. Children are to be accompanied by an adult and entry is by a combined one child/one adult ticket ($5.00). Extra children will each need a ticket @ $5.00. A gold coin donation from each additional adult (at the door) would be appreciated. • Extra adults: Gold coin donation at the door would be appreciated. 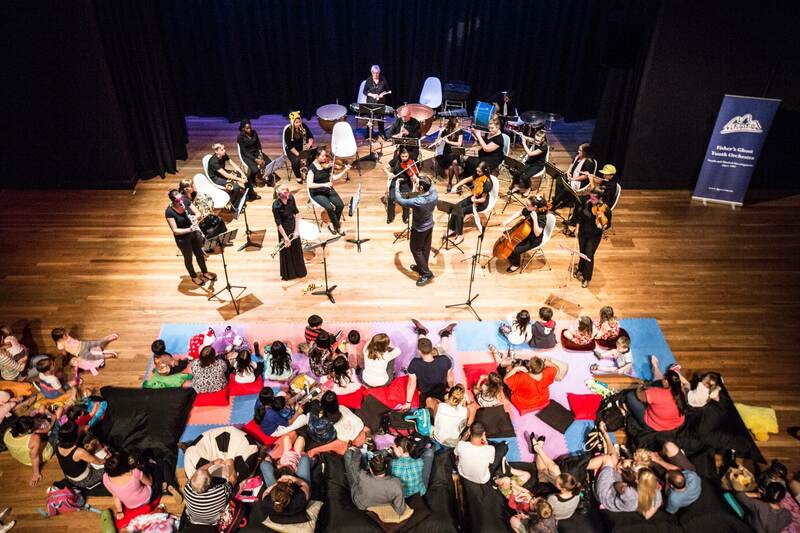 Bring your own cushion, or grab one of ours and get ready to enjoy one of the highlights of Campbelltown Arts Centre’s family music program as David Griffin and the Fisher’s Ghost Youth Orchestra present, A to Z: An Alphabet Adventure with the Orchestra. Aimed at children ages 2-5 this concert presents the perfect introduction to the instruments and sounds of a live orchestra in action. Book early to avoid disappointment! Bookings are open to Students who play an orchestral instrument, unfortunately we are unable to cater for percussion players this time. Lights! Camera! Action! The baton falls and the glorious sounds of the Fisher’s Ghost Youth Orchestra take you back across 15 years of movies in ‘Soundtracks of the 21st Century’. Under the leadership of Maestro David Griffin, the orchestra will perform recent favourites like ‘Skyfall’, ‘How to Train Your Dragon’ alongside classics such as ‘Lord of the Rings’, ‘Harry Potter’ and Pirates of the Caribbean’. All in all, the night features 15 different works. A particular favourite for the young generation will be The Cup Song from ‘Pitch Perfect’ (with a live cups!). On the other hand, the older generation will appreciate the majesty of Beethoven’s 7th Symphony, as heard in the ‘The King’s Speech’. Senior Orchestra will be performing prior to the opening of the Fisher's Ghost Parade. 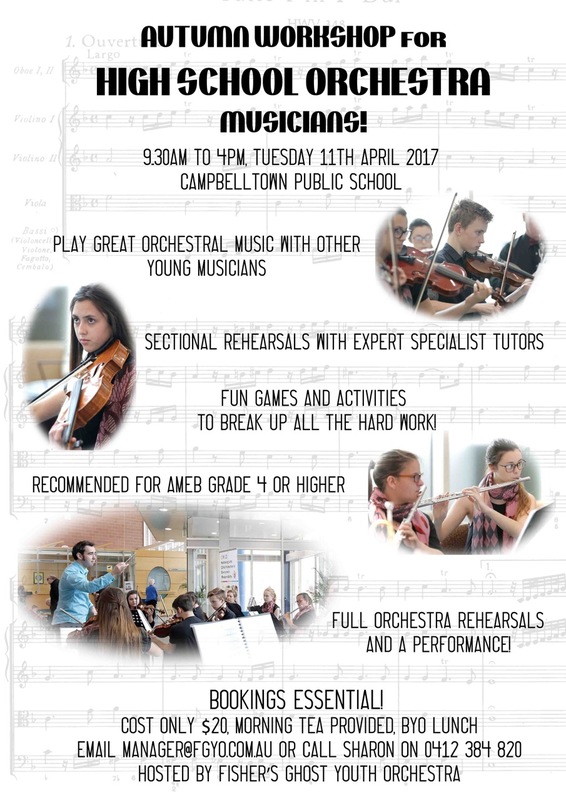 FGYO in conjunction with the Campbelltown Arts Centre, invite you to join with us in an exciting day of music making, culminating in an afternoon performance. Any player of an orchestral instrument between the ages of 8-16 are encouraged to join us, under the leadership of conductor David Griffin. Parents and Friends are also welcome to attend the 3.30pm concert. A concert where Bach meets the Beatles, with special guest soloist Catherine Bucknell in Vivaldi's Violin Concerto in A Minor! 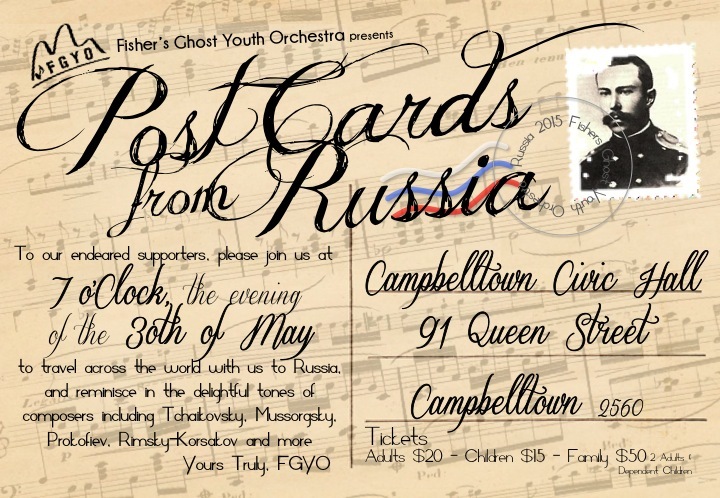 Join us for this exciting all Russian Musical Celebration. We enjoy works by some of the great Russian Nationalistic Composers, including Mussorgsky, Rimsky-Korsakov and Prokofiev. The program will also include well known favourites of Tchaikovsky including his 1812 Overture and Themes from Symphony No. 5. 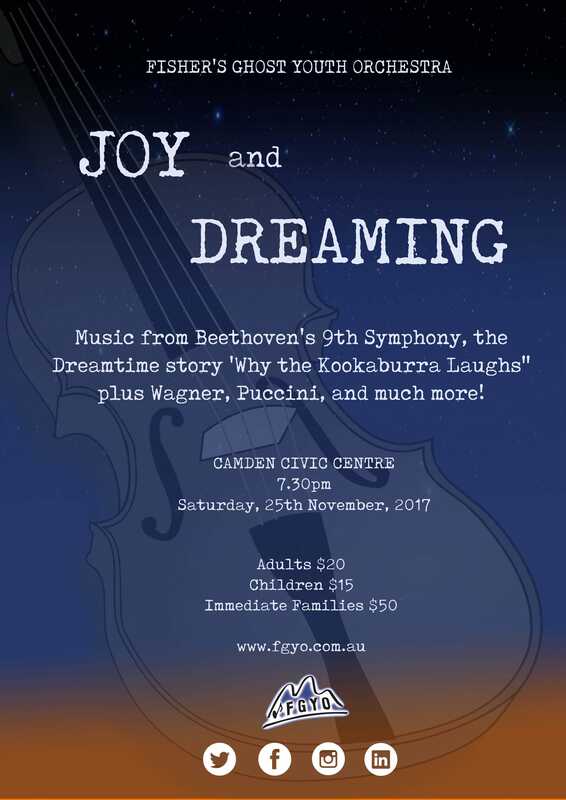 FGYO in conjunction with the Campbelltown Arts Centre, invite you to join with us in an exciting afternoon of music making, culminating in an afternoon performance. Any player of an orchestral instrument between the ages of 8-25 are encouraged to join us, under the leadership of conductor David Griffin. Parents and Friends are also welcome to attend the 3.30pm concert. Bring your own cushion, or grab one of ours and get ready to enjoy one of the highlights of Campbelltown Arts Centre’s family music program. 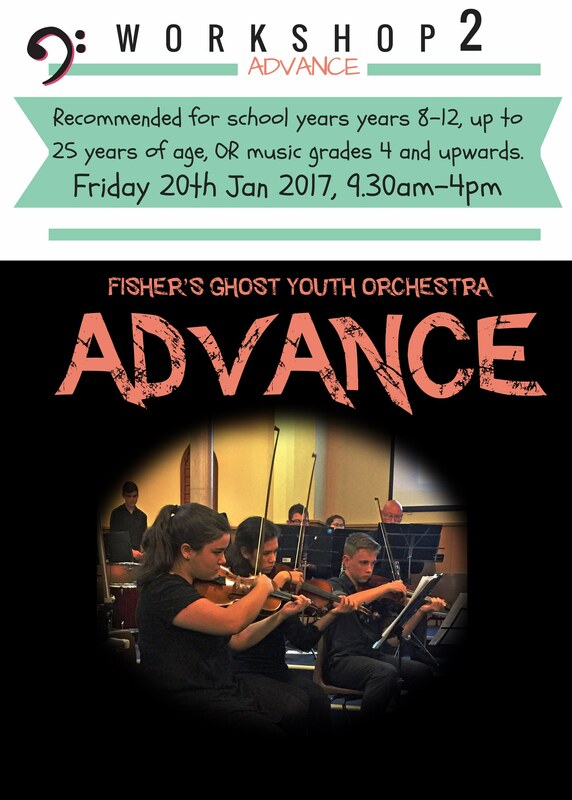 Get up close to the instruments of Fishers Ghost Youth Orchestra and experience the sounds of a live orchestra in action. Aimed at children ages 2-6, conductor David Griffin and the orchestra will present a range of music and styles from the classics to popular songs from television and favourite nursery rhymes. Book early to avoid disappointment! The first of two toddler proms by FGYO in 2015, aimed at ages 2-6. Kids will get up close to the instruments and experience the sounds of a live symphony orchestra in action. Come and enjoy our final performance for 2014 as we celebrate another wonderful year of music making with some Toe Tapping Tunes and Festive Favourites. Step into a magical realm and join us for our final concert of the year. 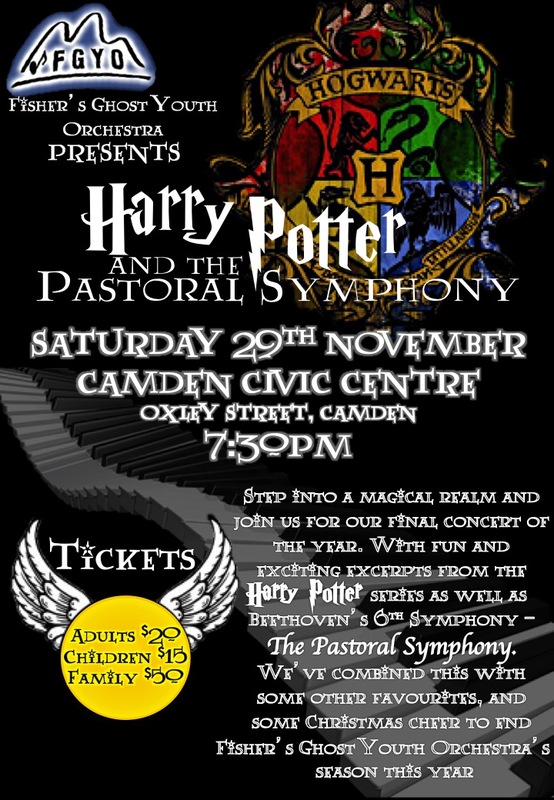 With fun and exciting excerpts from the Harry Potter series as well as Beethoven's 6th Symphony - The Pastoral Symphony. 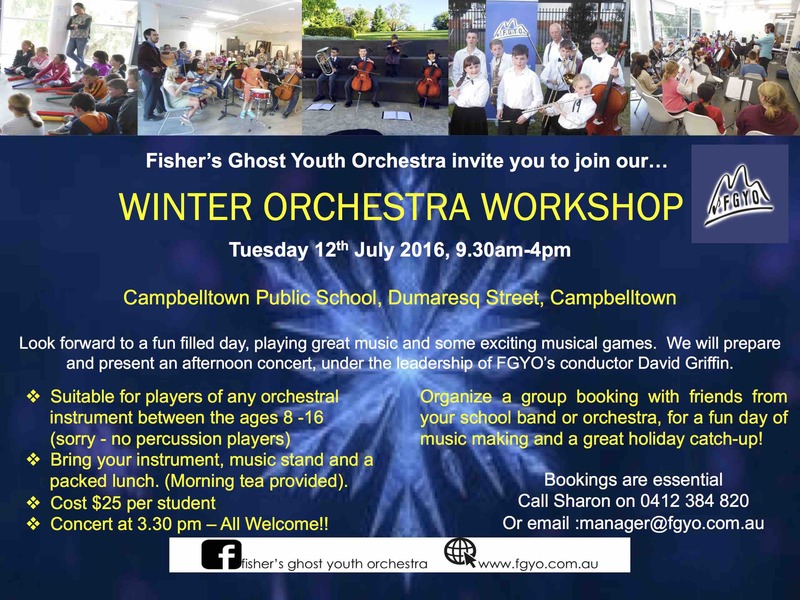 We've combined this with some other favourites and some Christmas cheer to end Fisher's Ghost Youth Orchestra's season this year. An action packed day, for music loving kids with AMEB grades preliminary to grade 2. Filled with games, playing music and creating fun memories. Celebrating the highlights of the last 10 years of Maestro David Griffin and the Fisher's Ghost Youth Orchestra. Celebrate the big tunes from the great Italian composers! Verdi, Rossini, Puccini, Respighi and more! FGYO present works from Strauss, Elgar, Mozart, Rossini, Beethoven, Tchaikovsky, Saint-Saëns, Sibelius and Offenbach in a performance not to be missed! We have been waiting years for International Star Wars Day to fall on a Saturday! Get in touch with your inner nerd and come to this concert dedicated to all things sci-fi. Featuring music from Star Wars, Star Trek, Halo, 2001: A Space Odyssey and more! Put on your berets for an evening of Musique de la France! You'll practically be able to taste the croissants and finest champagne as the orchestra perform music by Bizet, Berlioz, Debussy, plus a special performance of Saint-Saen's Cello Concerto No.1. 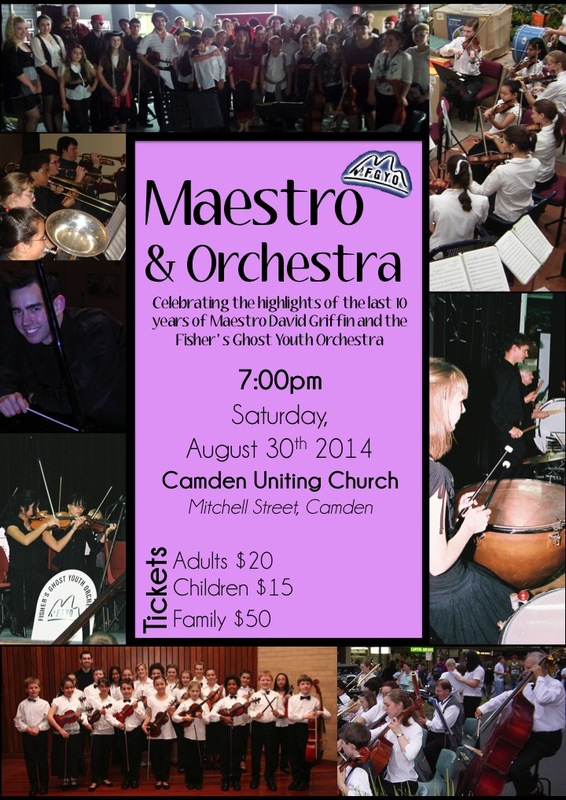 Fisher's Ghost Youth Orchestra performs at the first Camden Toddler Proms! Aimed at ages 2-5, kids will get up close to the instruments and experience the sounds of a live symphony orchestra in action - playing everything from classical music, to TV songs and favourite nursery rhymes! Enjoy music from 'The Lord of the Rings', as well as an eclectic range of other orchestral music including selections from Handel's 'Water Music', Saint-Saens 'Bacchanale', Tallarico's 'Advent Rising', Mussorgsky's 'Hopak' and more!